Rebuilding EU fish stocks could generate substantial financial resources for the European economy. On 6 February, the European Parliament voted in favour of proposals to reform the EU’s Common Fisheries Policy. Sebastian Villasante and Rashid Sumaila assess the problem posed by overfishing in Europe’s waters and outline some of the key areas which need to be addressed if the Common Fisheries Policy is to achieve its aim of ensuring sustainable fishing. Humanity has entered the Anthropocene era, with human activity a major driving force behind many environmental changes on the planet. In this context, marine ecosystems are key components of the global system, providing an enormous and diverse array of environmental goods and services (fishery resources, tourism, recreational activities, etc. ), in addition to helping to regulate the Earth’s climate. Beyond playing a crucial role in marine ecosystems, fish support human well-being through employment in fishing, processing and retail services, income, food consumption, and food security. According to the latest scientific research, marine ecosystems are in decline and remain under pressure from fishing. The effects of overfishing have been evident for many long-lived, late-reproducing predatory fish species at higher trophic levels. Many of the negative ecosystem effects of overfishing only become apparent years or even decades later. Excess fishing may generate significant economic losses across the world, contributing to the decline of fish stocks. One recent study estimates that resource rent net of subsidies (the figure left after fishing costs and subsidies are deducted from revenue) from rebuilt world fisheries could increase from the current negative $13 billion (US) to a positive $54 billion per year, resulting in a net gain of $600 to $1,400 billion in present value over fifty years after rebuilding. According to the study, the European Union (EU) is the most affected area in the world, with a potential annual catch loss of 2.8 million tonnes and a negative resource rent of $4.8 billion per year. In the EU, harmful subsidies to the fishing industry and fishing overcapacity have led to a general decline of commercial fish stocks and loss of jobs in the fisheries sector. Data from the European Commission indicates that 75 per cent of EU fish stocks are overfished, compared to 25 per cent on average worldwide. Overfishing in EU waters damages fish stocks, leads to uncertain catches, and makes the fishing industry financially vulnerable. Fragile fish stocks lead to suboptimal catches and this in turn leads to more fishing. For example, the spawning stock biomass of the North Atlantic cod – one of the most important commercial fisheries in the world – declined to its lowest historical level in 2006, with catches consisting mostly of immature fish. In December 2008 the European Council agreed on a new cod management plan. The plan adopted a new system of effort management and a target fishing mortality rate of 40 per cent. The International Council for the Exploration of the Sea (ICES) points out that although there has been a gradual reduction in fishing mortality and discards in recent years, the management plan for North Sea cod has not controlled mortality rates as envisaged. 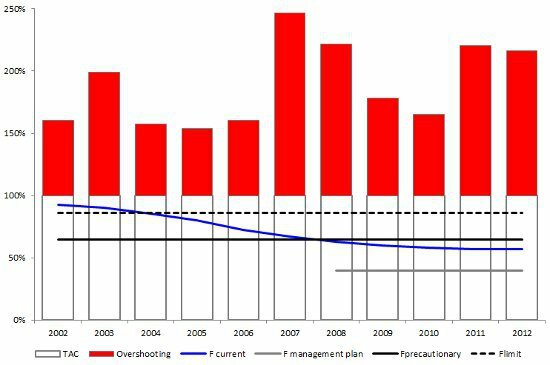 To illustrate, Figure 1 shows that landings are, on average, 200 per cent higher than allocated quotas under the 2008-2012 management plan (F management plan), and 176 per cent higher during the previous period (2002-2007) prior to the implementation of the plan. The sequential depletion of traditional fish stocks on EU continental shelves has spurred an expansion of fisheries towards new fishing grounds and commercial opportunities, creating the so-called “roving bandits” phenomena in modern fisheries management. The EU fishing fleet is one of the most active distant-water fishing fleets in the world, expanding its fishing activity into deeper waters in the North Atlantic Ocean and elsewhere. The EU fleet has expanded the depth of its fishing capacity by an average of 78 m for the 1950-2006 period, or almost twice the value (42 m) previously reported for the global fleet. This pattern of expansion towards deep-sea fishing grounds has not reduced under the Common Fisheries Policy. But the expansion is not limited to deep-sea species. The EU fishing fleet also expanded its geographical activity towards the rest of the globe with emphasis on the Southern Hemisphere, in particular in Africa and Latin America where fish stocks (mainly anchovies, sardines, hakes and squids) are highly important for fishing communities, and fishing activities engage several million people due to the lack of other alternatives of employment. While West Africa is said to be one of the most diverse, and economically important, fishing zones in the world, the Patagonian marine ecosystem also supports one of the most productive fishing grounds. Nevertheless, increased European demand for seafood, the liberalisation and opening of the fishing grounds to foreign fleets through joint ventures, and the EU fisheries agreements and the ineffective control and enforcement in local fisheries, led to continued overexploitation of the main commercial fisheries in these developing regions. In addition, the increase of illegal fishing activities has had negative ecological and socioeconomic effects. The Eastern Central Atlantic and the Southwest Atlantic Oceans rank 1st and 2nd worldwide in terms of total illegal catches, which implies annual economic benefits lost through illegal fishing between $205-606 million and $117-251 million, respectively. Fish is also one of the leading export commodities in these regions. In addition to its direct food value, fish also contributes indirectly to Africa and Latin America’s food self-sufficiency through trade and exports to the European Union, Asia and other countries. However, the fisheries in these regions have been developed under open access regimes, and unauthorised extraction (including recreational fishing), making these systems readily accessible for free riders, competition and conflicts, especially between local small-scale and foreign industrial fishing fleets. These global and regional patterns are undoubtedly the result of a rapid technological development of fishing fleets, which has led to an increasing number of overexploited and collapsed fish stocks over time, not only in EU waters, but also in the fishing grounds of developing countries. The entire fisheries sector (extractive fishing, fish canning and commercialisation subsectors) is affected, with all directly and indirectly employed people suffering the consequences of the chronic overfishing problem. Climate change is likely to aggravate existing production and consumption constraints in countries lacking food-security and it is foreseen that many people will increasingly be exposed to extreme natural events. More than a billion people worldwide live in coastal areas, particularly in developing countries, and these areas are much more vulnerable to climate change. With most fishery resources fully exploited or overexploited in Europe and elsewhere, opportunities for development lie primarily in restoring depleted stocks and catching fish more efficiently. Fish populations could strongly increase and generate more economic output if they were left for only a few years under reduced fishing pressure. Rather than demanding the highest possible catches immediately, fishers would be well advised to demand low increases in catches and a fixed upper catch below the theoretical maximum, once the stock is fully recovered. To realise these benefits, the European Commission needs to implement a rebuilding programme which would allow EU member States to substantially increase economic returns by up to $13 billion in just one decade. This would mean that at the end of the next Common Fisheries Policy (2013-2022) EU member States would have recovered most fish stocks, and the fishing industry could obtain positive resource rents, while maintaining employment and income in coastal communities. Sebastian Villasante is a Lecturer in Environmental Economics at the University of Santiago de Compostela in Spain and Karl-Göran Mäler Scholar at The Beijer Institute of Ecological Economics at the Royal Swedish Academy of Sciences. His research focuses on assessing the ecological and economic impacts of fisheries, aquaculture and recreational fishing activities; rebuilding marine ecosystems; governance of the oceans; climate change and marine ecosystem services. Rashid Sumaila is Professor and Director of the Fisheries Economics Research Unit at UBC Fisheries Centre. He specialises in bioeconomics, marine ecosystem valuation and the analysis of global issues such as fisheries subsidies, IUU (illegal, unreported and unregulated) fishing and the economics of high and deep seas fisheries. Its so important to rebuild our fish stocks. Everyone will benifit from these simple changes.